ART Q-151 CD COATING OIL is a special natural, colourless, ultrapurified oil made up of extremeiy minute molecules, endowed with an incredibile capacity for penetration and a very high light permeability. Moreover, being electromagnetically purified, it does not give rise to any prismatic effect and does not attack the poiycarbonate of the CD. 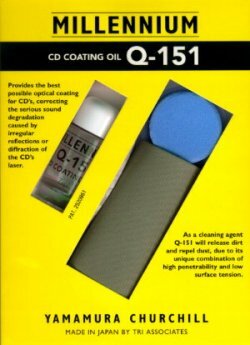 ART Q-151 CD COATING 0IL is not only an excellent cleaning product, but a definitive treatment for your CDs which improves their characteristics and enhances their performance. Since Compact Disc systems were conceived, using optical laser rays, the main deteriorating factors in ideai sound reproduction have been the irregular reflection of the optical ray on the bottom surface of the disc,caused not only by dust but also by production defects and irregularities in the Material. The polycarbonate from which CDs are made in fact has a very high light permeability coefficient, but in spite of this a small percentage of the optical ray is also diffracted, causing-reading errors and false-signals with unfortunate effects on musical reproduction. In addition to cleaning the surface of the CD, ARTQ-151 COATING OIL penetrates into the micropores of the poiycarbonate and forms a thin film on the surface of the disc, improving its characteristic of transparency and light permeability to an amazing degree. More by applying ART Q-151 COATING OIL, diffraction and the occurrence of dispersed optical signals are reduced considerably and focalization of the signal by the Laser is facilitated, giving the sound reproduction exceptional accuracy and definition, a clearer and more defined sound, a broader frequency response and a more focalized, detailed image.